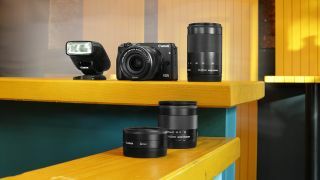 As the biggest camera manufacturer on the planet, anyone choosing the option of a compact system camera (CSC) from Canon immediately has access to the largest collection of lenses and accessories; albeit most connectable via adapter. That was a distinct advantage for the M3, being only Canon’s second ever CSC on its initial launch, following the EOS M which was released three years previously. The stylish finish and nicely detailed grip indicate a seriousness of intent that matches its manufacturer’s enticement of the portability of a compact but a performance closer to that of a DSLR. Another perceived advantage Canon has over the sheer range of equally compact CSC models offered by Panasonic and Olympus (who have been releasing such cameras since 2009) is the fact that this miniature EOS has the larger APS-C CMOS sensor, which, at 24.2MP, offers a relatively high pixel count for its class. Also benefitting those who have chosen for the camera for shooting video as well as stills is the fact that its touch screen LCD flexibly tilts upwards by 180° and down by 45°. Connectivity is key in these times, and Canon blessed this one with the must have features of Wi-Fi and NFC for sharing of shots with a smartphone or tablet. A 49-point AF system, which betters most consumer DSLRs on paper, plus a DIGIC 6 processor make for an enticing package – on paper, at least. Smaller in size than a DSLR, if a burst shooting speed of 4.5fps is a little so-so compared to rivals, at least this is possible even when shooting data-hungry Raw files. Unsurprisingly there is video capture offered here too, even if Full HD 1920x1080 pixels at 30fps feels a little last year compared to the glorious 4K possibilities promised by rivals. Unfortunately we don’t get an eye-level viewfinder built in either; though that’s an optional extra at least. More positively, low light shooting is possible thanks to a sensitivity range expandable up to ISO 25600-equivalent. In conclusion, the Canon EOS M3 is a solid feel, unthreatening, and moreover approachable option for someone stepping up from their smartphone and looking to take first steps into interchangeable lens photography.